After serving a four-game suspension for testing positive for a banned substance, the Saints' Mark Ingram is eligible to return this week against the Redskins. You could say that he's excited. Ingram was so happy to rejoin his teammates, he reportedly was waiting for them at the airport when they got back to New Orleans, according to The Advocate's Nick Underhill. The Saints landed back in New Orleans last night around midnight. They spotted a familiar face waiting for them just outside of security. It belonged to Mark Ingram. The Saints have started the season out strong. After dropping their first game to the Buccaneers, they've won three straight. Ingram is returning on an elongated week for the Saints, who will play the Redskins on Monday Night Football next week, with Drew Brees just 201 yards away from the NFL passing yardage record. Ingram rushed for 1,124 yards last year, a career-high and his second straight 1,000-yard season. In his absence, Alvin Kamara has done most of the heavy lifting for the offense, with his 611 yards from scrimmage accounting for 36.5 percent of the Saints' total offense. You've got to think Kamara will be happy to have Ingram back to get the dirty yards, as the Saints' second-leading rusher this year is third-string quarterback and wildcat extraordinaire Taysom Hill, with 67 yards. Kamara has 275, including 134 yards and three touchdowns against the Giants on Sunday. 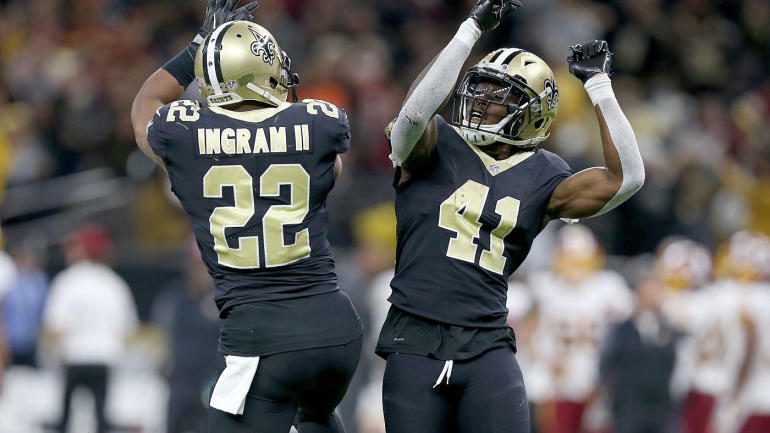 Kamara predicted Ingram's enthusiasm, saying after the Giants game that Ingram would likely be waiting. Ingram's biggest benefit might be for the defense. By getting a workhorse onto the field that can pick up the yards between the tackles, the Saints defense -- which struggled heading into Sunday despite the team's hot start, but played better against the Giants -- may get a bit more time to catch its breath on the bench. Sean Payton has been very deliberate in how he's used Kamara these first four weeks, getting him the ball often but trying not to get him killed between the tackles. With the Saints' two-headed monster returning, it should help the team with its pedestrian 14th-ranked time of possession. It's unlikely the Saints will go right to giving Ingram 18-25 touches in his first week back, but that isn't tempering his enthusiasm. The fact that an already good Saints team is getting a key weapon back is a scary prospect. If Ingram can be the player he was last year out of the gate, it's hard to imagine the Saints slowing down any time soon.